Young voters: Low turnout is typical. 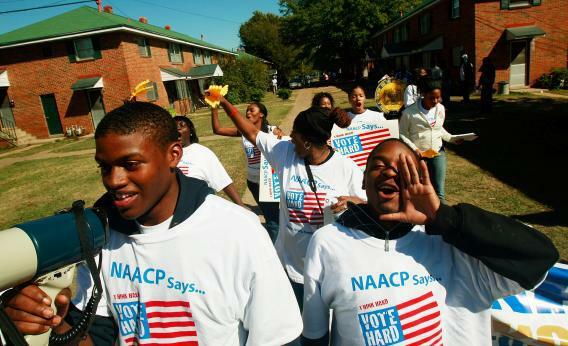 College students on the NAACP’s ‘Vote Hard’ bus tour Selma, Ala.
Ah, summertime before the election, when a slow news cycle plus a need for election-based stories creates mini-trends that rise and are discarded as if they were being produced by Forever 21 or H&M. Today’s mini-trend is “young people are disillusioned with Obama,” a content-free story designed to be forgotten as soon as it’s read. Both the New York Times and the Huffington Post are running with the story today, and both fail to establish anything more than that there’s a possibility that young voters may turn out to the polls less this year than in 2008. The actual reason for this expected dip in voter turnout is deeply unsexy, a phenomenon known as “regression to the mean.” The Times story gets a little closer to this, interviewing young people who just became eligible to vote but probably won’t. Even though journalist Susan Saulny tries to make this problem sound like it’s unique to this environment, “don’t know, don’t care” voters are and always have been more concentrated in the young. The only reason the 2008 election had unusually high turnout amongst the young is that it was a uniquely exciting election, and there’s no reason to expect those levels of excitement to hold steady. The Huffington Post story is even stranger in the gulf between the thesis—that young people are disillusioned with Obama himself—and the example that writer Peter Goodman comes up with. He follows a young woman who was an ardent Obama supporter in 2008 and who appears to have, in the past four years, gotten married to a young man who is deep into libertarian nonsense, and now she’s a Ron Paul supporter. Even though she gives reliable soundbites blaming Obama for her worldview shift, I’m not convinced. I think Goodman actually happened on a couple that’s a great illustration of another, more real phenomenon, which is the impact marriage has on women’s voting patterns. We know that married women are far more conservative voters than unmarried women, and we also know that single men are more conservative generally than single women. One part of this, therefore, might be that in the battle over whose values are going to “win” in a relationship, men tend to dominate and that women are adopting their husbands’ political views alongside taking their husbands’ names. The woman Goodman profiles openly admits that her husband’s views have persuaded her over to the dark side. Since women her age aren’t liberals who married libertarians, I question using her as an example of anything typical to young voters today, much less young female voters who we can still say confidently will turn out in greater numbers at the polls than young men their age. If you dig through both articles, the real story of young voters and Obama actually comes out. Young people still support Obama in the same numbers they did in 2008; the needle hasn’t really moved there. What is of actual concern is that they’ll return to pre-2008 voting levels, which means fewer votes from a group that’s wildly pro-Obama overall. This doesn’t speak much to disillusionment as to a return to the normal state of affairs where young people just don’t vote as much as people older than them. It’s trouble for the campaign for sure, but there’s not really a moral to this story.